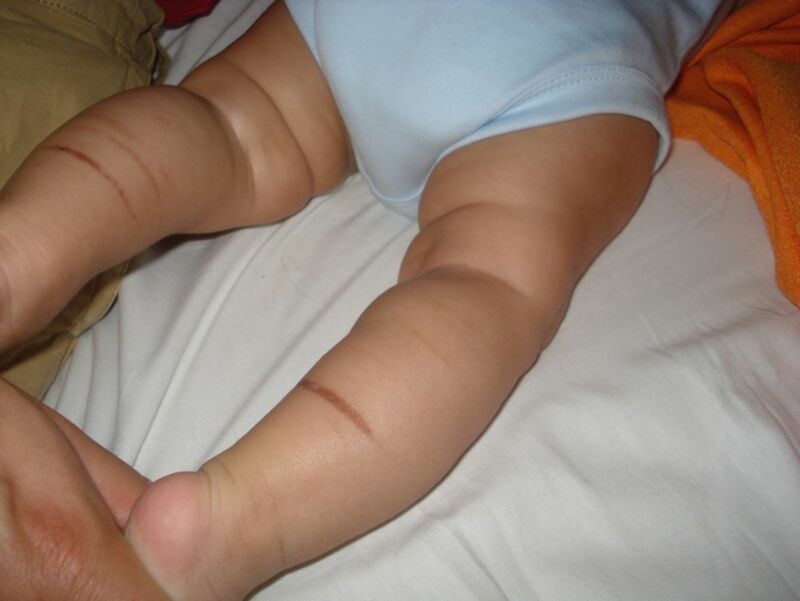 We present a 4-month-old healthy male infant of Asian/Mediterranean origin with partially circumferential hyperpigmented bands on the lower legs. The appearance of these marks led his health visitor to be concerned about the possibility of non-accidental injury. He was referred to the local paediatric unit and admitted for investigations, including a skeletal survey. Two weeks before, the elastic of a new pair of socks had led to red circumferential marks at exactly the same site (figure 1). These erythematous marks evolved into the hyperpigmented bands seen by his health visitor. The marks (figure 2) corresponded precisely with the site of compression by the elastic of his socks. Acute curvilinear band (parental photograph). The aetiology is not clearly understood, but it is thought to relate to dermal inflammation or panniculitis caused by sustained compression, resulting in postinflammatory hyperpigmentation. It is important to recognise this condition and to distinguish it from non-accidental injury with ligatures. Although it is not possible to predict which infants are most at risk, it is prudent to advise parents to avoid excessively tight socks and mittens.
. Sock-line hyperpigmentation: case series and literature review. 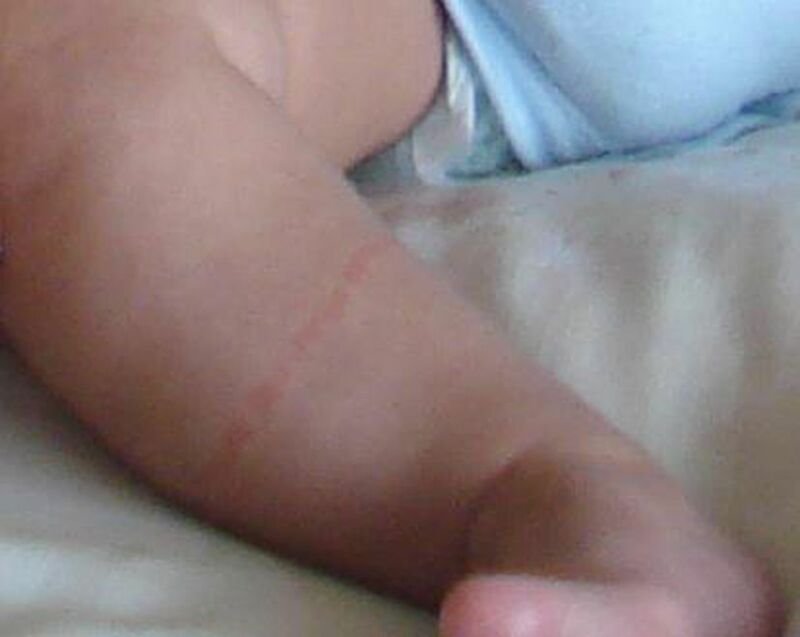 Arch Dermatol 2007;143:428–30.
. Raised limb bands in infancy; a post-traumatic aetiology?. Br J Dermatol 2007;24:391–3. Contributors MG, Consultant Paediatric Dermatologist, edited the final article draft before submission.